Flora Paul is head of content strategy at UOL, the largest Brazilian online content and digital services company. With a bachelor’s degree in journalism and working for print and digital media for over a decade, Paul was a reporter for MTV and Glamour magazine before developing content strategy for BuzzFeed Brasil. Hi everyone. Welcome to episode number 43 of the Content Strategy Insights podcast. I’m really happy today to have with us Flora Paul. Flora’s down in Sao Paulo, Brazil. She works currently for an outfit called UOL which is … I’ll let Flora tell you more about that, because it sounds kind of like AOL meets GoDaddy or something like that. Can you tell me more about UOL? It’s one of the largest and oldest portals in Brazil. I remember when I was using dial up internet in 1997, we would use you UOL to connect to the dial up. It’s pretty old in a way, but they really kept up with what was happening in the internet board, and they’re really trying to focus to gain more millennial views, so they’re really trying to be up today. That’s so interesting because when I look at this site, I see a combination of AOL and Yahoo, which have completely lost relevance in the U.S. They’re just gone, but UOL is huge. I think, they’re the fifth most visited website in Brazil. Is that correct? Yes, I think that’s right. It’s huge, and the numbers are pretty close to Facebook and Google actually. It’s a huge portal. Usually, people would just go to UOL to know if their internet connection is running. It’s like that kind of site. Everyone knows it. Again, back to the AOL. I remember back then people thought of AOL as the internet. It sounds like that’s how UOL is. Interesting. Recently, you were with a cooler job, well, I mean, a job that more people in the U.S. might recognize. You were an editor and a writer and a content strategist at BuzzFeed. Tell me a little bit about your time there. The reason I invited Flora on the show, everyone, is that I came across a post or something where you had talked about measuring content effectiveness. I think you came up with the term editorial intelligence. Tell me a little bit about that, how that came to be. It’s off now. Sorry about that. What did you discover? Where there particular metrics or patterns, or how did you turn that from just raw data into actionable editorial insight? Well, I think in a way, my job is to transform data, boring data numbers into cool content. What happened is you take a look at the top posts. You take a look at the flop posts as well, and you try to see patterns in them. When we use such and such . . . like frames or formats that we’re working, how we could develop there. If food is something that people really click to read, and quizzes they really like as well, so let’s do more food quizzes and see what happens. Pretty much, it always works, so I started setting goals for our team. Like, “Wow, now we have to do like trivia food quizzes this month to reach a certain goal of page views.” It always pretty much worked, so I started setting goals looking at our numbers. That’s interesting. Maybe I’m just projecting my impression of it, but you developed an impression of BuzzFeed, and you think, “Oh, it’s kind of click bait like quizzes and headlines and stuff,” but you identified patterns. I assume these were replicable and that you could grow and iterate on them and do … Was there a lot of fine tuning and ways to engage maybe different people or more people with subsequent versions of stuff? Because at the same time, that is cool that everyone has access to the numbers, that can start to become a certain pressure in the whole team. I didn’t want them to be so stressed, so I was pretty much giving a formula. Like, “This is what works. We can do a few posts like such and such that will work, and will give us page views, and we’ll hit our goals, and we can have room to create other things, new things because we’re guaranteeing the page views we should be getting.” It was like using the numbers and formulas on our side of the game. I mean, those numbers are just right there transparently in the editorial department the whole time. Tell me about how you manage those dynamics. We could look at the page views. I mean, the really business side of the company was really separate from the editorial. That’s why I decided to focus on the term editorial intelligence and not business intelligence because that could be too literal. I feel like it’s a way. Journalists, they really like writing, and they don’t really matter other stuff. It was an easy way to look at the numbers and just work with it. Well, no, I think what you just said is true in my experience as well. What is it in your background do you think that made you curious about those numbers and willing to quantify journalistic effort? That’s not a real common path among journalists. No, true. I was working on such cool places like MTV and Glamour Mag before BuzzFeed. Then I decided to do something so serious, I guess, but I guess I’m a type A personality person and very organized and things like that. I noticed that looking at numbers, I could make out all of our life easier. That’s all I did. I just wanted to make sure we were organizing and registering because we’re just going with the flow, and we never really registered anything about our growth so I really wanted to be that person to organize it. Probably way better to have somebody like you doing it than an MBA from the business side coming over and … Tell me about that. Did you interact with the business side, like the circulation or advertising or other people on the business side and tweak the data or your editorial intelligence based on that? I would get on Looker, which is a great SQL tool. It’s a great SQL tool. I would get the average views from posts that had fast food or mentioning any brands on the title or throughout the whole content. That would give us leads. Like, “Should we go to a fast food company?” Well, obviously yes, because we were millennials, but that can work with pretty much anything. For example, millennials don’t really have cars so maybe we shouldn’t try to sell cars, and so it was . . .
You’re informing sales strategy with the editorial insights that you have. Exactly. I never really knew if it worked or not, if they sold or not, only when it was up online already. I think the work was not only to help the team, the editorial team to make the team feel better about themselves and work happy and stuff, but overall, I think it helped all the teams from BuzzFeed. Hey, I wanna back up a a little bit to that Looker tool that you mentioned. You said that’s like a SQL lookup tool, like a reporting tool to look in. Do you have a custom CMS at BuzzFeed, or where was all that content stored? BuzzFeed has a lot of cool tools that they don’t self-develop. Dao who now is she for something big. I think recently, she was product and now she’s leading other stuff as well. She alongside Jonah Peretti was one of the founders of BuzzFeed, and he always focused on making great products. BuzzFeed itself had a lot of good, very easy understandable tools so everyone could stay on top of their game, but there was Looker who is an outside company that you pay a lot to have access to their tool, and they really use your database and analytics as well. They had really good numbers. The thing with Looker, it’s not very intuitive but you really can get any answer if you’re patient enough to learn, and if you know a little bit of code. You can get any answer. I would create dashboards for the whole team to keep up with our progress and how our goals were going. It wasn’t just about figuring out numbers. You could actually create visual aids to the team. Oh, interesting. Did you use Tableau or another visual front end thing . . . ? Looker is the Britney to Tableau’s Christina or something like that. I get what you mean. That’s interesting. With all those tools and all that data and information that you’re working with, but you’re still going back and forth with the editorial team on the creative side of things and you’re coming up with … You’ve mentioned you have some templates and formulas that work, and then some conventions that work, which you can validate with all that data. Can you tell me how all that went back and informed? Are there like story formats or different things that you did based on that data that were then validated by subsequent looks at the reader behavior? I mean, BuzzFeed has pretty classic formats. There’s the listicle. Well, now there’s a lot of quizzes. There’s how internet is reacting to things with very popular tweets. There were a few formats. Not a few, there were a lot of formats actually. I was crossing frames and formats. If a format goes well, like a trivia quiz, any trivia quiz about food would do super well in Brazil. Then, “Well, you know what, our readers really like TV series. Maybe we should try to do a trivia quiz about TV shows and stuff like that.” That usually had good results. Sort of a general interest publication like Buzzfeed, you have that opportunity. Well, there’s just a big grid of things that you do and verticals that you go into. Right. You could use the numbers to back it up. For example in Brazil, in the first two years, Brazilians hated quizzes. It didn’t work at all, and then all of a sudden, Brazilians started loving quizzes. It started doubling up the page views to very huge numbers. Wow, that’s super interesting because you think of culture is being slowly evolving, and like, “Oh, Brazilians just don’t like quizzes,” but all of a sudden, what do you think happened in there? What do you think was the change? I don’t know. International, BuzzFeed started to … U.S. BuzzFeed started doing more quizzes because their audience always like it, and probably started spiking the page views as well. One of our best writers did one very simple checklist. It was like, “Are you too nice and people step on you because of that?” It went viral. I think, people really … The key to BuzFeed’s success was relatable content. I guess, one day, our audience understood that quizzes could be relatable. Actually, the first format that did super well with quizzes were checklists, because you would just go checking. We would joke like, “Our readers are starting to know themselves through our quizzes.” It started with checklists, and that was really relatable. They would share like, “Oh, I am 70% something.” People started to really liking BuzzFeed quizzes, and then we started … They got a little bored of that, and they started liking personality quizzes in general, not just listicle quizzes. Then we started doing trivias. The product team was always really coming up with new formats. We would just explore more and more. That was pretty much how it started. With BuzzFeed, everything had to be relatable, and if you really hit that note, that relatable note, it works. It was how it worked with our quizzes in Brazil. Interesting, that relentless focus on the reader and the customer, which reminds me of I wanna hear about how it evolved for you. You went from being . . . your title when you first started at BuzzFeed was writer, staff writer or editor, something like that. Staff writer, but then when you left, you were identified as a content strategist. … It’s not hard to infer from everything we’re talking about how that happened, but what was the professional track to that? Did you just wake up one morning and your boss said, “Hey, you’re a content strategist?” How did that …? I was that annoying type A personality person who was always wanting more, and so every end of the year, I was like, “I need more. I need to grow. I need new titles. I need new goals.” Since I was super organized, I was already leading learning labs with the other staff writers. I started editing as well. Then it was like, “You know what, really organize, maybe you should take a look at the numbers as well since you think we should start registering that.” I pretty much started doing it, and then they were like, “Well, you’re being promoted to content strategist.” I was like, “Oh, okay, cool.” That was it. Great. Well, congratulations . . .
There’s something else I was going to ask you. I know about. Back to the story templates, I’ve had this ongoing theme in this interview series of people talking about how a lot of organizations are … They’re very creative and always coming up with unique and new story ideas. The other end of the spectrum is people who just have a system and stick to it and then execute on that. It sounds like BuzzFeed, and I don’t know, is UOL like that as well, more on the not formulaic but maybe, and template is not the exact right word, but having a formula and a way of doing things and then filling that in with the current relevant content versus somebody like the New York Times doing long-form stories or something like that? Long reads. I feel like for BuzzFeed, honestly, finding the formulas was a way to guarantee we had good numbers and we could create more freely. At the same time that I was putting goals to the team, you should do such format or such frame or such themes. At the same time, we would do the freaky Wednesday day, and everyone could publish the craziest ideas they had. We really tried to balance that. UOL is they’re really pushing long reads as well. They’re trying to go into that really actually old school reporting with really long interviews and pretty photos. At the same time, it’s a huge team. There are more than 200 journalists there. There’s a little bit of everything. You can get informational news and also really long reads. They’re really trying to balance that. 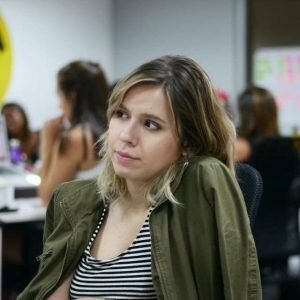 Buzzfeed Brazil, we were just relying on formulas so we could be crazier at the end of the day. So you could buy yourself some time to do the creative fun stuff. That seems like a fair deal. Yeah and everything in BuzzFeed was pretty fun. It wasn’t like the formula really killed the fun part of it, because the content itself is funny and relatable and easy going, so the formula was just there to help. I noticed we’re already … These always go so quickly. We’re coming up on time, but I always like to give my guest one last chance. Is there anything that hasn’t come up that I haven’t asked you about or that’s just on your mind about content strategy or content in general these days that you’d like to talk about? Well, I was really impressed with how the media was interested in what I was doing, so I found a job pretty quickly after the layoffs, in two days after the layoff. I feel like it’s rare because there’s not a lot of people … You can read about data journalism, but that’s not the same thing because that’s focused on the actual writing and not the process of how things get done and managing for the team. It was actually weird to realize that what I was doing wasn’t so common, and there was interest in that. The first thing I told all my friends that were looking for jobs were like, “Please put strategy on your LinkedIn profile because people are really looking for a strategy people, and we know content. I mean, we just have to study a little more, but we really know content and numbers are not that hard.” I feel like there’s a lot of room for content strategy and editorial intelligence and things like that. It’s pretty cool actually. I do feel like I’m still doing journalism. I’m just in the background. I’m behind the cameras. I’m behind the typewriters, but it’s still pretty exciting and it’s pretty cool when you realize an insight you gave worked, because it doesn’t matter if something is a formula, it always can not work, but it’s really fun when it does. It’s really gratifying when it does. Like you said, it gave you the opportunity to do other stuff as well that’d be more creative beyond formulaic stuff. We shouldn’t be afraid of numbers and formulas and stuff. We like writing, but we can be friends with numbers and data and stuff. Exactly. I actually liked math in high school. I don’t know. We all know that as writers, our bosses are really wanting us to make bigger numbers. We know that, so might as well deal with it and not avoid it. No, we can all take that lesson that you got. If we just get better at showing the success of our work, we’ll get more of it. Exactly. Numbers are on our side. Great. Well, thanks so much, Flora. This has been great. I really appreciate you taking the time. That was super nice. Thanks for having me.